Kiian is a leading global Ink supplier of high quality, sustainable speciality products that provide unique printing solutions for the graphic, textile and industrial markets. With a distribution network that covers more than 90 countries worldwide and offices in Europe, Asia and the USA, Kiian Ink Supplier delivers solutions for a screen, industrial, speciality and digital printing. Kiian covers colour like no one else. It has developed inks for both the tradition analogue screen printing industry as well as for digital inkjet printing. 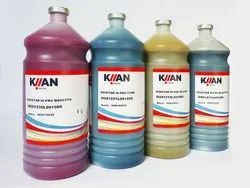 Formulations go beyond standard four colours CMYK: Kiaan delivers a wide gamut alternative with light tones, deep blacks, spot colours and ‘ fluo’ additions for direct to textile as well as transfer printing. All developed with the highest quality standards in mind. Negi is official Indian Reseller for Kiian Inks in India. We offer a complete range of Products manufactured and distributed by Kiian.